"The weeks since the fight have definitely been the worst time in my life. Everyone says boxers know the risks. But do they, do they really?" On 26 March 2016, boxer Nick Blackwell collapsed in the boxing ring he had shared with Chris Eubank Jr following a gruelling British title contest. It would be over two weeks before Blackwell would open his eyes again, as family and friends were left with no alternative but to sit at his bedside and wait... and wait. Blackwell won his most important battle, that for life, having suffered a bleed to the skull and being put into an induced coma, but at just 26 years old and theoretically in the prime of his career, he will never again lace up a glove as he ponders a life without boxing. However, for his trainer Gary Lockett, it has to be business as usual as he resumes the responsibility of guiding an entire stable of fighters. A former world title contender as a boxer and part of the famed team which oversaw the undefeated career of Joe Calzaghe, Lockett admits the experience of the past months have fundamentally changed him as a person. "I could really see no light at the end of the tunnel, even if Nick made a full recovery. At the time, I could think about nothing but negatives," Lockett told BBC Wales Sport in his first interview since the fight. "Things aren't always as bad as they seem at the beginning and I just thank God that he is OK.
"I am pretty old school and don't like to talk about my feelings too much. But let's just say it was very easily the worst two weeks of my life, by a long, long way. "Nick's best friends, Jake and Gareth, they didn't leave the hospital for nine days. "I decided to stay back and I was at my in-laws in Mumbles. But I was just useless, totally useless and I decided I would be better off travelling up to the hospital every day. "I think I went up about 11 days out of the next two weeks. "At home, I felt useless. At the hospital, with his friends, with his family, with the people who loved him, I don't know what it was, but I felt like maybe I was helping him, maybe he knew I was there, even though he was in an induced coma. "Nick has a very good core of friends, they were in there most days, his dad John, his brother Dan, his sister Hannah; they were there every single day. "We took over a whole waiting room at the hospital and I think as a group, we upset a lot of people taking up so much space. But it was only out of love for Nick. "It makes me feel selfish for saying that it was the worst time of my life. Because imagine what Nick's family were going through. Worse than what I was dealing with. It's horrendous." Lockett utterly rejects the notion that boxers are 'prepared' for what can go wrong in the ring, insisting that understanding that something is dangerous and being ready to deal with the consequences are two very different things. "Everyone says that same sentence when something like this happens - 'they knew the risks when they got in there'," he said. "Do they? Do they really? "When you see a kid you are in the gym with every day, who you have a very good relationship with, when you see them on a life support machine for the first time, it is like being hit by a tonne of bricks. "I don't think I have ever seen anything that shocked me as much as that and it will never leave me, it will always haunt me. "Even talking about it five weeks later is really difficult. "One of my boxers, a younger boy and I won't say who it is, he came up to visit Nick and I said to him, 'you need to prepare yourself'. "He went in without me and nearly fainted, walked out and couldn't get hold of himself afterwards. It was very, very hard to deal with. "To see them like that, someone that I suppose you love in a way, you know, I love Nick in a way, not like a child of mine, but I am spending time with him day after day. "You see someone that you love propped up, with tubes down their throat; God knows how many drugs going into his body, wires coming out of everywhere and a screw in his head, with his hair cut off, a shadow of himself. It's very, very hard to see." Lockett, who deleted his social media accounts following the fight as certain critics looked to blame him for not stopping the contest, says the support of the Blackwell family meant a great deal. "The other people, the ones criticising, either don't know what they are talking about, or they are people with an axe to grind," he said. "So people who I have fallen out with over the years, they would have been rubbing their hands together. "But what do I care? The main thing for me is I had the support of Nick's family and that was unquestionable, unwavering. "That made me feel at ease, all his friends, his family, no one mentioned the fight being stopped until Nick collapsed. "I have not watched the fight back and I never, ever will. "But I am told that nobody even mentions the fight being stopped, even in the seventh round when Nick was under a barrage." Lockett admits he did want to leave the sport completely, but has since had a change of heart. "Of course I did [want to quit], of course I did," he said. "But then as Nick gets better, you start to consider the other boys in the gym. 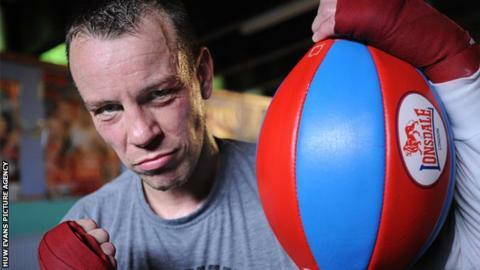 "There are guys in that gym - Enzo Maccarinelli for example - who I have absolutely huge admiration for. "Enzo, Liam Williams, a load of guys coming through, I could not consider walking away and letting them down." Lockett is hopeful Blackwell in time will complete a course that allows him to help train fighters and work their corners and has promised him a role with the team if he wishes. "Well whatever he does decide to do, he's got a bloody good head start, financially. "He's a happy-go-lucky guy and shrewd with his cash and whatever he decides to do, I am sure he will be a big success. "I would like to see him get his training license as he's got a lot to offer. "Liam Williams world champion, with Nick and I in his corner? It is definitely a possibility and what a story that would make. It would be the icing on the cake."